It’s not unheard of to see a smirk when mentioning to someone that you make use of a branded painting handle. You’ll sometimes hear that you can get the same results for mere pennies in the form of painting pots or the odd lid with a bit of solder coming out of it. 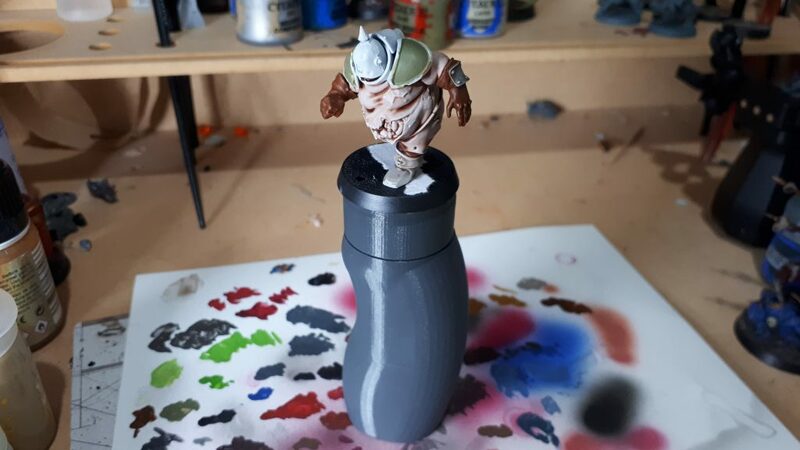 With the Citadel paint handle stirring a fuss for its price, we see other competitors releasing products of their own. Competition breeds innovation, of course! 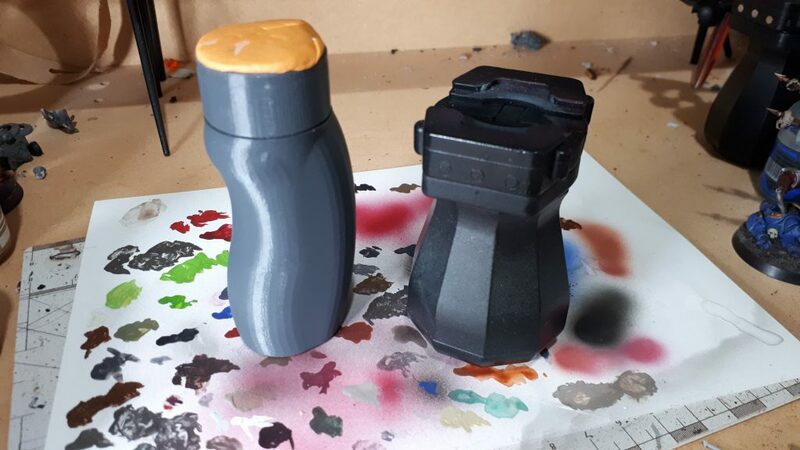 Redgrass Games having recently successfully crowd-funded their wonderful wet palette have stormed in with a Kickstarter for their own painting handle. The RGG 360 painting handle comes with a literal twist, however. 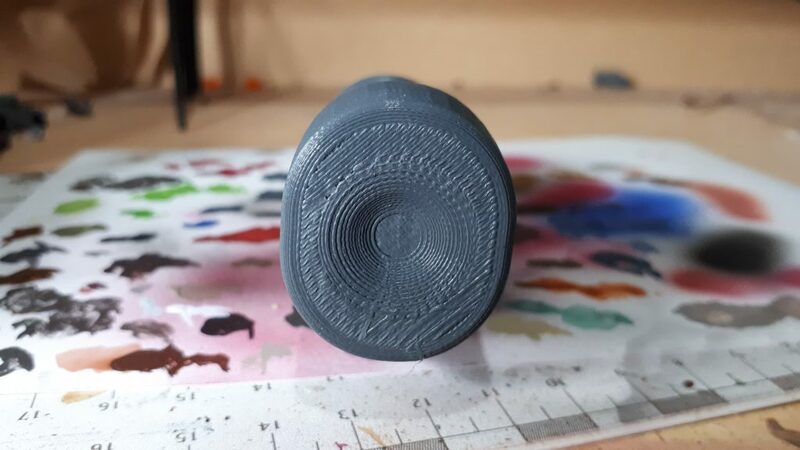 It features a spinning top which can be used to rotate whatever your painting with ease at the simple press of your finger. Holding the handle itself is comfortable and ergonomically there’s little to complain about. Your fingers naturally find their place with the weight and material both feeling right naturally within your grip. However, the prototype certainly doesn’t feel like a finished product, not that it should. I’d certainly hope that there’s some iterations to be made. The item has the telltale signs of being 3D-printed with the ridges/grooves helping to an extent in aiding your grip. Although, it feels like a little more flash here might go the extra mile. It’d certainly help to push the RGG 360 above its peers. A nice, rubber groove on the handle, for instance. Something similar on the base would also help just to make it look like a more refined item. It doesn’t need to look pretty for what it does, but it wouldn’t hurt. This handle holds onto models via the use of mounting putty which goes atop the handle. It’s orange in colour and feels very sticky to the touch, but without feeling unpleasant or lingering on your fingertips. Apprehension quickly set in when I attached a Chaos Space Marine to the putty. I was concerned that the model could fall off with relative ease. Swiftly, I was proven wrong. I ran a series of tests to find out just how durable and adhesive the putty was. The handle was dropped, I violently shook it, I slammed it on the desk a couple of times. The model was truly secure in place. If anything, the putty left me worried when removing the model intentionally. I had worries that I’d sooner break the model off the base rather than the base parting from the putty. It’s something that I’d need to find a balance with over using it but it does warrant some caution. Another worry, bar the finesse and aesthetic of the handle was the longevity of the putty. The putty is exposed to the air at all times and will retain the shape of whatever you stick to it. It takes quite some force to try and smooth it out again, which in itself isn’t strictly an issue. Although, I worry that having the putty exposed most of the time might decrease its lifespan. 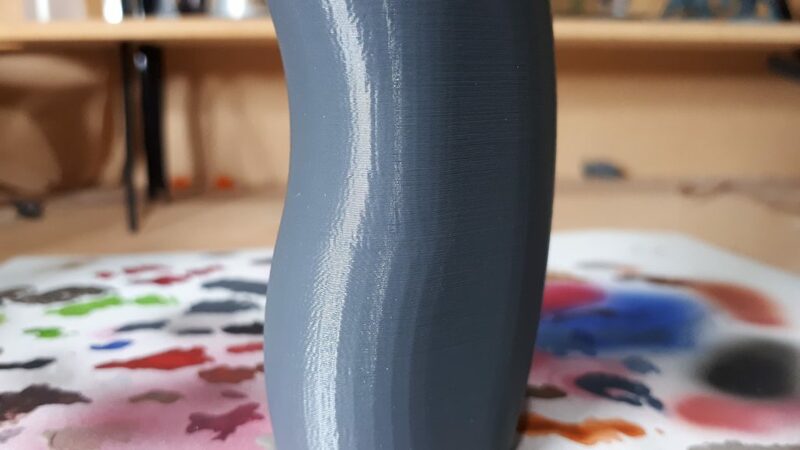 With the amount of dust and matter it is exposed to, I wonder if this might hinder the adhesion over time and warrant the putty being replaced sooner than hoped. This may well be a non-issue, of course. I am prone to worry. The up-side is that you can get additional putty to replace old putty on the RGG 360 should you wish. 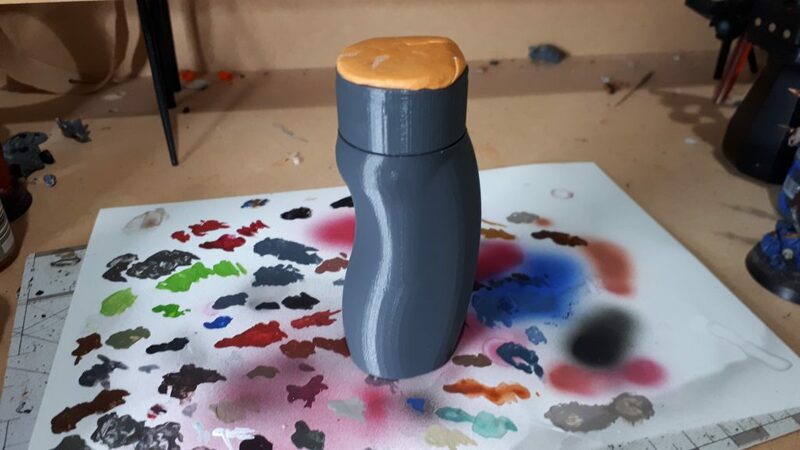 However, a cap or removable top would not only help to sustain the putty but might help to improve the handle from a visual standpoint, as well. The RGG 360 absolutely feels like a company taking an existing product and trying to take the next step forward. 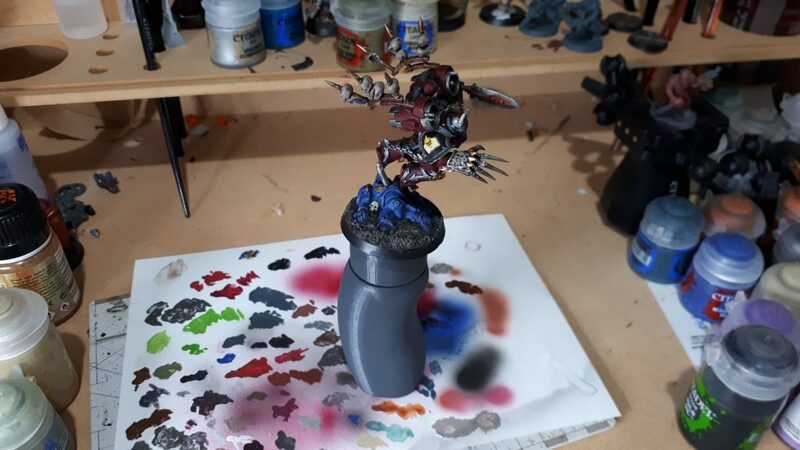 The spinning top on the handle might sound gimmicky, but it does provide at least a better level of comfort and precision when painting. It requires just the right amount of force to spin it without fear of it turning when you don’t want it to. You can also feel safe in the knowledge that any model stuck onto it isn’t going to fall off in a hurry. It may not be the most visually-appealing painting handle in the market at this time. It may also not be a colossal deviation from existing products. However, what the RGG 360 does achieve is showing that other companies are now taking risks and stepping forward into the market of accessories and tools in our hobby. This will end well for us hobbyists in the long run and this feels like a great start. The RGG 360 feels very similar to the wet palette also released by Redgrass Games. It isn’t essential, but if you have some expendable income then it’s a nice item to have just to provide a little more of a luxurious hobby experience. I just hope that when it comes to the final product that it can look the part, as opposed to the scruffy appearance it currently exhibits. Though, when it comes down to it, it might not be very pretty but it is unquestionably functional. The kickstarter ends January 31st. Be sure to check out the campaign rewards should you not wish to miss the boat. We regularly post updates on our Facebook, so be sure to give us a follow on there so you don’t miss out.